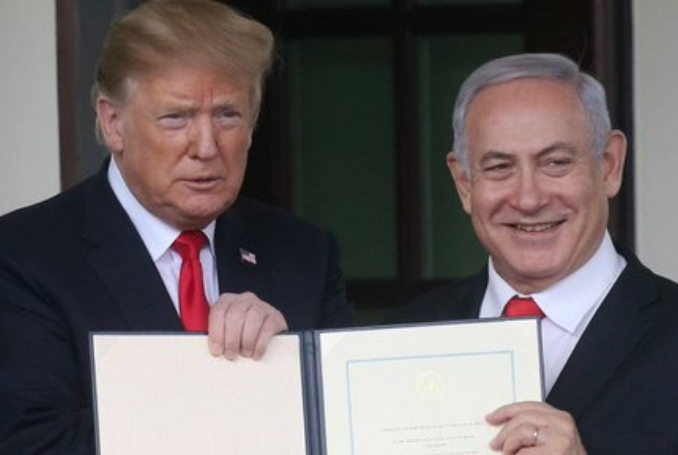 With Netanyahu looking over his shoulder at the White House, Trump signed a proclamation officially granting United States recognition of the occupied Golan as Israeli territory – a dramatic shift from decades of US policy. Netanyahu welcomed Trump’s action and said Israel had never had a better friend. He harked back to two previous Middle Eastern wars in justifying Israel‘s need to hang on to the Golan. The U.S. recognizing Israel’s sovereignty over the Golan Heights could result in an all-out war between Israel and Syria. Palestinian President Mahmoud Abbas and Gaza-based resistance faction Hamas both slammed the decision. Meanwhile, Ismail Haniya, the leader of Hamas in Gaza, said the Golan Heights would “forever remain an integral part of Syria”. At the UN, Secretary-General Antonio Guterres is “clear that the status of Golan has not changed,” UN spokesman Stephane Dujarric said. A UN Security Council resolution adopted unanimously by the 15-member body in 1981 declared that Israel’s “decision to impose its laws, jurisdiction and administration in the occupied Syrian Golan Heights is null and void and without international legal effect”. Be the first to comment on "Trump’s Support for Israeli Golan Heights Generates Global Condemnation (VIDEOS) #Palestine #GroupPalestine #israelTerrorists #boycottIsrael"